Technology continues to change our daily lives and how we run our businesses—gone are the days of brick and mortar only businesses as many individuals run a home-based business in our modern world. What exactly is a home-based business, you ask? There are two possible tests, one of which must be met for a business to qualify as a home-based business. One test is for the home to be the principal (or main) place of business, which generally means that the business does not have a physical location elsewhere outside the home. Many contractors will have their main place of business in their home as they prepare quotes for customers, order supplies, and do bookkeeping in the home while other business activities like meeting with customers and performing contract services are done at various customer locations. The second test is for a space inside the home to be used exclusively to earn business income and used on a regular and continuous basis for meeting clients, customers, or patients. In other words, you need a designated separate home office, as your kitchen table will not meet these criteria. Now that I know I have a home-based business, what expenditures can I deduct? You can deduct a portion of rent, insurance, and operating costs, such as heat and lights, if you do not own the home. If you own the home, you can deduct a portion of interest on a mortgage (remember the mortgage principal portion is not deductible), property insurance, property taxes, and operating costs, such as heat and lights. Maintenance costs and minor repairs that relate directly to the space where the home-based business is located likely qualify as a deductible expenditures. A portion of expenditures related to general maintenance of the home such as repairs to a furnace or air-conditioner or the purchase of household cleaning supplies would also likely be deductible. So how do I determine the deductible portion? The expenditures must be apportioned between business and non-business use of the home on a reasonable basis. Generally, it is recommended that the square footage of the home-based business space be divided by the total square footage of the home. For example, if you use a bedroom as a home office and it is 10 feet by 10 feet, then it occupies 100 square feet in the home. If the total square footage of the home is 2,000 square feet, then 5% (100/2,000) of the expenditures can be said to be for the home-based business. Assuming that 5% of the space is used for the home-based business, then the tax deduction would be $1,050.00 ($21,000.00 x 5%). It is important to remember that your home-based business deduction is restricted by the profit from your home-based business. In other words, if you only made $1,000.00 this year from your home-based business, then you can only deduct $1,000.00 of expenditures even though you have $1,050.00 of home-based business expenditures as calculated above. Not to worry: the extra $50.00 can be carried forward and deducted in a subsequent taxation year as long as the home-based business continues to meet one of the two tests discussed above. 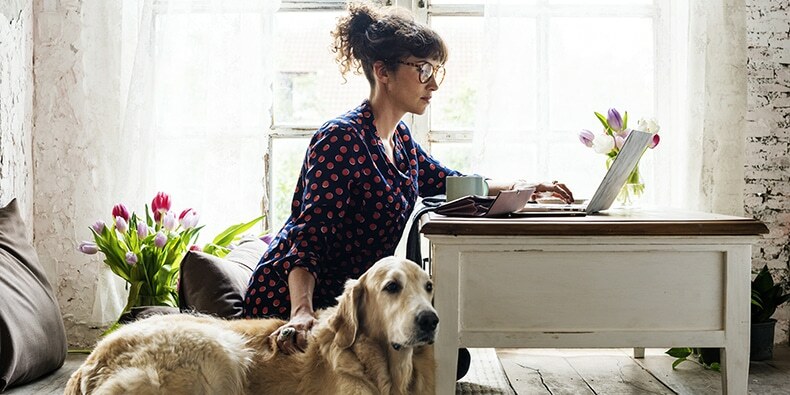 While running a home-based business may allow you to work in your pyjamas on cold, snowy days, any tax deduction claimed must not be taken lightly and you should always save your bills, invoices, and receipts to support the deduction. Connect with Lisa online at Lawyer Lisa or Mainwood Legal Services or find her on LinkedIn! Lisa Handfield is a lawyer practising in Calgary, Alberta, in association with Mainwood Legal Services. As both a lawyer and a Chartered Professional Accountant, she is uniquely qualified to work on a wide range of legal issues. More importantly, she enjoys working with individuals to help them solve their problems quickly, efficiently and cost-effectively. Her background includes over 10 years of experience including working for the Canada Revenue Agency Appeals division, in-house for a large corporation, and working with high-net-worth clients of a major bank. Lisa has both a Masters of Law degree and a specialized designation as a Trust and Estate Practitioner. Today her practice focuses primarily on corporate law, trust law, estate planning (wills and estates), estate litigation, taxation (including GST), and tax dispute resolution. When she's not practising law and helping solve her clients’ legal challenges, she spends her time with her husband, young daughter, and three family dogs.